This fall and winter, you’re going to be seeing a lot of new hardshell jackets and pants touting their use of the new Gore-Tex C-Knit waterproof-breathable membrane. What is it, how does it work and how will it stand up to the competition? As with all things waterproof-breathable, C-Knit is purposefully shrouded in marketing obfuscation. The makers of these technologies are apparently uncomfortable allowing consumers to draw comparisons for themselves, so release only select test numbers (presumably the most flattering ones) while bad mouthing others and generally fail to communicate the actual merits of their products. Is C-Knit more or less breathable than other 3-layer laminates in Gore’s range? Frustratingly, they won’t tell you. So, here’s our best guess based on the limited information available. Make sure you read our article Rain Jackets, Explained to get a full understanding of how these things work, but the basic idea is that its really easy to keep rain off, but keeping rain off while allowing sweat to escape is really hard. And, without evacuating that sweat, you’ll still get wet, ruining the point of a waterproof jacket in the first place. 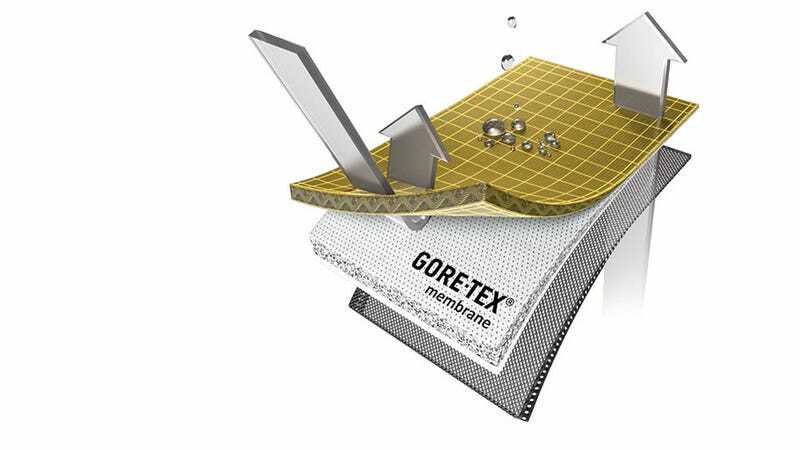 So, Gore invented a vapor-permeable, but drop-proof membrane by stretching out teflon into an incredibly thin sheet. The resulting membrane was too fragile to be worn on its own, so requires a durable outer face fabric and an inner liner to hold it off your clothes or skin a bit in order to work. All other three-layers have done similar. The other back story (who knew rain jackets were so freakin’ complicated?!) is that there’s a war on Gore-Tex raging right now. That’s a big deal because Gore dominates the outdoor apparel industry and is notoriously demanding of its “partners,” the companies it allows to use its technologies in their apparel. Failure to comply with Gore’s will can reportedly result in falling behind competitors on marketable features or being cut off entirely. Won’t someone think of the consumer? “The new backer is made with extremely fine yarns on circular knitting machines, producing a fabric with a little bit of stretch.” Stretch is key because it’s not a traditional feature of waterproof-breathables, but it is a hallmark of the new kid on the block, Polartec Neoshell. That exceptionally breathable membrane is grabbing headlines as well as hearts and minds, if not much market share. Still, Gore seems eager to fight back before sales volume becomes an issue. To promote C-Knit, Gore has chosen the RET or Hohenstein breathability test to present its performance most favorably. It doesn’t list any other numbers. Dependent on how heavy a face fabric C-Knit is fitted with, it returns anywhere from a 2.0 to a 5.8 result. That’s really good! But it’s only a part of the picture. Other membranes in Gore’s range also score a sub-6 Ret score, notably Pro, Active and Paclite. eVent also scores in the 3-5 Ret range. How’s Polartec NeoShell perform? They won’t tell you. You see, all these membrane makers are just as bad as each other at obfuscation through selective release of numbers. And these tests are really difficult and expensive to perform in specialized labs, so no magazine or blog test with a bubbler can reasonably hope to replicate them. In fact, Polartec says it doesn’t believe in lab tests (even though it’s happy to state a 10,000mm water resistance for NeoShell), preferring instead real world subjectivity. What difference we can divine between C-Knit and NeoShell lies in the definition of “windproof.” As with all its other membranes, Gore says C-Knit is 100%, while Polartec claims 99.9% for NeoShell. In that tenth of a percent lies a fundamental difference in performance. While pressure (heat) must build up behind a 100% membrane to evacuate the water vapor, it flows more freely through 99.9%. So NeoShell should remain the victor in terms of breathability. How’s C-Knit compare to Gore Active and Pro? It sounds like it’s lighter and softer, which should lead to garments using it carrying the same attributes. So it’s mainly a comfort thing. By further divination through examination of new products using it — the $300 Arc’teryx Norvan and $500 Patagonia Refugative, for instance — we can further conclude that C-Knit is not limited in its performance or cost. So what’s C-Knit, in layman’s terms? It’s a new inner layer for Gore’s existing membrane that helps facilitate breathability and comfort, but which still can’t breath as comfortably as the competition. If I were a marketer for Polartec, I might consider putting that message out there. Maybe even with some numbers.